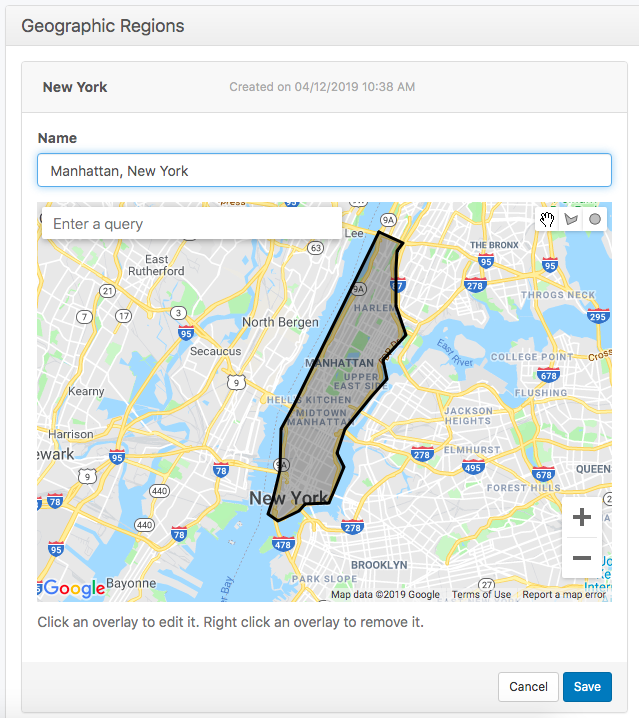 OnSign TV offers features to play Campaigns within GeoRegions. You can also set Campaigns to be triggered when crossing a geographic limit. For this purpose, you need to define the areas beforehand. 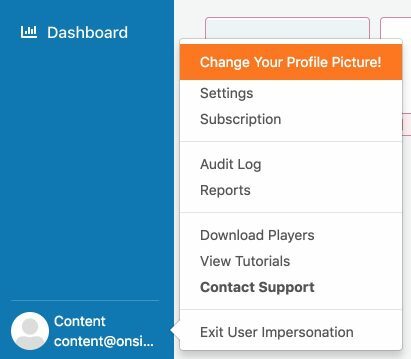 In your OnSign TV account, click on your username at the bottom-left. Then, hit “Settings”. 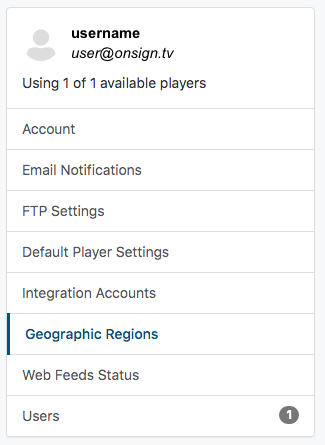 Select “Geographic Regions” from the sidebar menu. Click on the “Add Region” button at the top-right corner. Name the region and draw the area on the map. Search for a country, state, city or other places by typing in the top-left text field on the map. Use the zoom in and out button on the bottom-right corner of the map to adjust the map sector. Alternatively, you can roll the mouse’s scroll wheel. Use the tools on the top-right to draw on the map. Use the hand button to slide around the image. Select the circle to mark average areas, but we recommend the polygon tool if you intend to determine small and irregular areas. With the polygon tool, you start with a click on the mouse and draw lines. Each click is another anchor point. Finish with a complete area. Once you have completed a full drawing, you can move the cutout by holding it clicked. You can edit the cutout by clicking and releasing, then dragging the appearing dots to adjust the shape. Right-click the layer to delete and begin a new drawing. It is possible to have several areas marked on one GeoRegion. You can already set this region to play back a triggered Campaign. Create as many regions as you need. Click on the icons on the right to edit and remove the GeoRegions.